Discussion in 'The Lounge' started by Quo Fan, Sep 24, 2012. Shot some soccer on Saturday, and did a spin and watched some football on Sunday. The NFL and the NFLRA need to resolve the lock out. That is all I'm saying. 'Morning. Last day in South Carolina today. Headed home late tonight. Wife and I rode in an MS charity event this weekend and did back to back centuries. 17.8 mph Saturday, 18.1 mph yesterday. 200 miles total. I'm toast this morning. My last three rides have been centuries. I don't ride though. Right? So I had a fairly eventful (and painful) weekend. On Friday night I caught one of my feet on my son's bouncy seats and broke a toe. 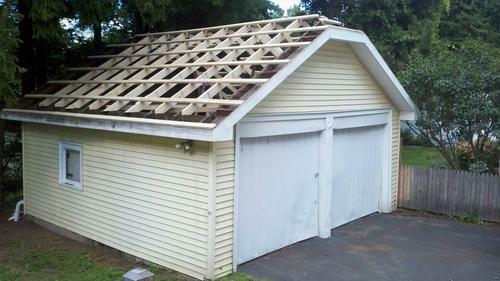 On Saturday I walked around with a broken toe while we ripped the roof off of my garage. During the clean up of the mess of the roof tear off I stepped on a nail with my other foot. The nail went through my boot but luckly it only broke the skin so I was able to get the nail out myself. On Sunday we replaced a lot of the rafters and now the garage is ready for the new tin roof. Ugh... I'm so tired and sore. So I had a fairly eventful (and painful) weekend. Geez, Mike. Rough weekend! Mine was much better. Hike Saturday, beers at the local brewpub Saturday night to celebrate my birthday, and then a bike ride yesterday. Can't get much better than that. That does sound like an awesome weekend. Mine was pretty similar, hiking, beers, biking, beers. If yours was as good as mine, you're probably ready for the next one to start already. Time to catch up on crap around the house.